In an era of increasingly sophisticated mobile technology, it's tempting to assume that smartphones and tablets provide users with a wealth of content wherever they want it. But achieving a great multimedia viewing experience in bright light, particularly in sunlight, has been an ongoing problem for the consumer electronics industry. 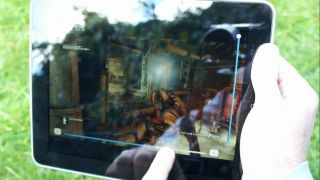 As anyone who has ever tried to play an immersive game or watch a movie on a phone in bright sunlight knows, the subsequent glare and lack of highlight and shadow makes for a fairly dismal viewing experience. But all this could be about to change. At IFA 2013 in Berlin, London-based company Apical unveiled an intelligent digital processing technology called Assertive Display, which offers radically improved resolution in bright light, and a dramatically reduced power consumption. The technology has already been rolled out in Japan, where it features in devices such as Sharp's new smartphone, the Aquos SH-01D. According to Apical CEO Michael Tusch, Assertive Display will transform the mobile viewing experience of gamers and movie viewers alike. "The whole point of these mobile devices is that we should be able to use them wherever we are," he says. "But unless you're in a dark room, your experience is heavily compromised. If you were a first person shooter game addict, for example, nobody would play that on anything other than a bright screen in a fairly dark room. "It's the same story with movies. Ideally, you need the 5000-to-1 contrast ratio of a TV to show a movie. An iPad can do 1000-to-1, but if you went outside that would diminish severely, to 20-to1. "And it's not just in sunlight, it's the same if you're just sitting in a room with windows or with bright lighting. Your multimedia experience is being degraded, and we can avoid that." Most mobile device manufacturers rely on adjusting screen brightness to improve viewing experience. But this is ineffective and the biggest drain on battery power. Instead, Assertive Display works by adapting the contrast ratio, adjusting each pixel of the video stream in real-time, with very short latency so that you don't notice. The technology is based on a model of how the human eye works, tuning the pixels so that you can view a movie or play an immersive game in bright light without killing the battery. The result is a radically improved viewing experience with dramatically reduced power consumption (up to 50%) due to the fact that you no longer require maximum brightness of the backlight to view content. "The thing to remember is we're not changing the brightness or the power of this display at all," stresses Tusch, "we're just tuning the pixels to adjust the contrast ratio." Of course, mobile device manufacturers have tried to solve this problem themselves, spending colossal amounts of money on achieving strong blacks on displays, putting anti-reflection coatings on screens, making them brighter and more power efficient. "But actually, that's pretty much working in the margins," says Tusch. "What we're simulating here is a display that has 100 times higher contrast than we really have. And we're doing it via video processing, as opposed to controlling the display power. The whole aim of Assertive Display is to adjust the contrast ratio without you ever noticing. Viewing conditions are monitored via the tiny light sensors on mobile devices and the pixels are tuned accordingly. There is no slider or button to control Assertive Display. It's always on, continuously reading the viewing conditions and controlling the contrast ratio automatically. Smartphones and tablets featuring Assertive Display technology will be available in the UK by autumn 2013, according to Tusch. While he refuses to divulge which manufacturers will ship products with this technology, it seems clear that it will encompass Apple and Android devices. One of the major challenges for Apical is overcoming the slow cycle from the design stage through to market. This is due to the complexities of having numerous parties licensing their technologies on the same 'real estate' of the processing chip. To overcome this hurdle, Apical is seeking to run Assertive Display as software, so that each successive generation of the technology can be delivered as a firmware update or a software upgrade. To help achieve this, Apical recently joined the HSA Foundation, an increasingly powerful alliance of manufacturers whose membership includes Samsung. The industry response to Assertive Display so far has been unanimously positive, says Michael Tusch. Most of the major smartphone and tablet makers have seen the technology. "Just about every company that has seen it has liked it and wanted it," he says. "It's had that real 'wow factor'." This is not that surprising, considering that Apical appears to be the first company in the world to have cracked the problem of viewing multimedia content in bright light on mobile devices. This was a point highlighted at the conclusion of Tusch's IFA presentation in Berlin, by Phil Rogers, president of the HSA Foundation. "I know you're a fairly modest chap," he told Tusch on the keynote stage. "But I just hope people realise that for any colour display today to be viewable in bright light, it has Apical technology. And no one else has solved this have they?" "Well it's a problem that can't be solved by display alone," replied Tusch. "We've got a solution and it works. So yes, I think you're right."